Equisetum, the official name, is very old and very hard to eradicate. With gardeners growing more native plants all of the time, there is still one native many hate to see. It is among the most ancient natives, dating back to the Devonian period, 350 to 400 million years ago. I’m talking about equisetum, which goes by the common name horsetail. My interest in the plant has been sprouting in the past year, even though I have been weeding it for decades. Equisetum is a tough plant. It has no leaves. Like ferns, it produces no seeds, instead spreading by spores that are about the size of dust particles and by underground rhizomes, according to University of Maine horticulture Prof. Bryan Peterson. My interest in horsetail was piqued about a year ago when George Jacobson – professor emeritus of biology, ecology and climate change at the University of Maine – spoke to the Longfellow Garden Club about how climate change will affect plants. He included equisetum in the talk. Then during a tour of Fort Williams Park in Cape Elizabeth, I noticed that low-growing junipers in one of the fort’s newly planted gardens had been overtaken by horsetail and that in other, still wild parts of the park, horsetail was climbing three or four feet tall on honeysuckle and other invasive species. In August, while my wife and I were touring Denali National Park in Alaska, the guide asked what we’d like her to discuss. Among the options? Horsetail. Prompted by me, the guide told us that horsetail grows throughout the park and is one of the most important foods for grizzly bears. All of that meant – at least to me – it was time to write a column on equisetum. I called Jacobson for a refresher. 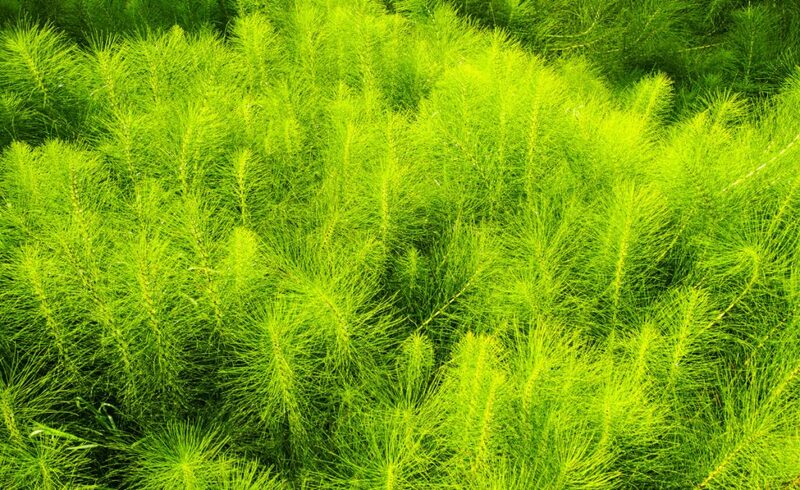 When equisetum was formed, the earth’s atmosphere had 20 times more carbon dioxide than it does now, he explained. Given those high levels, equisetum didn’t need leaves. With so much carbon dioxide in the atmosphere, the plant could form sufficient photosynthesis to grow just from its stems growing upright. Then the Carboniferous period began, and equisetum died (some types at that time grew much larger than they do today). Instead of decomposing in the air, they were buried in boggy areas and transformed into coal, oil and natural gas, trapping the carbon and resulting in less carbon dioxide in the air. Fossil equisetum has been found in basalt-type rock in Baxter State Park, Jacobson said, adding that these plant remains were declared Maine’s official state fossil. Another interesting fact: Despite the increase in carbon dioxide in the atmosphere caused by the burning of coal, oil and gas that has been sequestered so long, carbon dioxide could never increase to the level it was when equisetum was first formed many millions of years ago, Jacobson said. At most, it could double or triple, he said, which still would cause major changes in the environment. Both Peterson and Jacobson were surprised to hear that grizzly bears in Denali gorge on equisetum. “They must be really hungry,” Peterson joked. An integrated pest management (IPM) worksheet he sent me warns that horsetail is “highly toxic to livestock and can kill animals that eat a large amount of it.” While animals rarely eat enough of the living plant to kill them, it is a serious problem when horsetail is dried as part of hay. Part of what makes horsetail unpalatable is that it contains high amounts of the compound silica, which makes up quartz. That silica explains why one of the alternate names for equisetum is scouring rush. If you are caught in the wild with dirty pots and pans and no scrubbie, try giving them some spit and polish with equisetum. Why is equisetum so hard to eradicate from gardens? While it lacks leaves, equisetum’s stems are ribbed, Jacobson said, and the extra area could help with photosynthesis. Also, because equisetum reproduces by tiny, dust-like spores, it can be spread great distances when blown in the wind. It also spreads by underground rhizomes, and its root systems are brittle, which means that no matter how deeply you dig to try to pull up horsetail by its roots, you will inevitably leave some behind. And since the rhizomes contain a lot of nutrients, you can count on them to sprout again. Some options for controlling equisetum do exist. Horsetail doesn’t like shade, so if you grow a lot of plants above the horsetail, you can slow it down. The IPM sheet suggests covering an area with black landscape fabric to keep down the horsetail where the fabric is located, but bear in mind that the aggressive rhizomes will run to the edge of the fabric and sprout there. One method will eliminate it, at least in theory, according to the IPM sheet. I don’t know many gardeners who could do this successfully, however. If you go out in the garden every two weeks and remove all of the sprouts, after three or four years you will have starved the rhizomes and killed the horsetail. Don’t expect to take any long vacations during gardening season if you take this approach. Gardeners who don’t have equisetum must take care not to import it. They should examine any topsoil or fill brought to their gardens closely for equisetum roots and spores. And they should do the same for plants they bring in, either from a nursery or a friend’s property. Horsetail can be attractive in a garden. Some types resemble miniature bamboo trees. Others have an attractive feathery look. But beware: just about every plant book warns that equisetum is highly aggressive. Gardeners who actually want this plant are advised to take precautions: Don’t mix equisetum with other ornamental plants because it will overtake and strangle them. Gardeners with plenty of space could grow a large swath of horsetail, but as a precaution, they should install rhizome barriers to prevent it from spreading underground. Mostly, experts advise gardeners to limit horsetail to containers and put the containers among plants in a flower garden, if they like. My wife, Nancy, and I won’t be bringing any into our property, however. Because while I’ve enjoyed learning more about equisetum, I know I wouldn’t enjoy dealing with it in my garden.